Key difference: The primary difference between the two is the fact that while a freelancer is nearly always an individual person, an independent contractor can be a person, a company, a business, or a corporation. It can unofficially be said that a freelancer is a type of independent contractor. The terms Freelancer and Independent Contractor can be quite confusing as at first glance they look to be identical. After all, both work independently and are hired by companies to do work on their behalf. However, they are difference from employees, in the manner that they don’t work for the companies directly, but instead a have business – client relationship with them. However, there are certain differences between a freelancer and independent contractor, even though they may be subtle and not noticeable at first glance. The primary difference between the two is the fact that while a freelancer is nearly always an individual person, an independent contractor can be a person, a company, a business, or a corporation. Still, the process would be the same; both would be hired by another person or company to do some work on their behalf, for which they would be paid. This person or company cannot regulate their work or tell them how or when to do the said work. They would provide a set of expectation and guidelines that they expect to meet and the freelancer or independent contractor would have to meet them. However, the how of the situation is left to freelancer or independent contractor. It can unofficially be said that a freelancer is a type of independent contractor. Doctors, dentists, veterinarians, lawyers and a host of other professionals who own their own businesses are labeled as independent contractors. This also includes freelancers, such as freelance writers, editors, copywriters, designers, etc. However, for the most part the terms are used interchangeably and do tend to mean the same thing in common parlance. 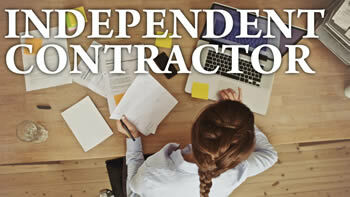 In fact, in most legal matters, including taxation, freelancers are considered and treated as independent contractors. Freelance writers, editors, copywriters, designers, etc. Doctors, dentists, veterinarians, lawyers, freelancers, etc.